A tribal tattoo can be impersonal, but adding your name to the design can remedy this by making the design specific to you. There are several ways to add a name to a design, including hiding it in the design, creating the lettering in a tribal fashion and using text combined with a traditional tribal design. The tradition of hiding a name in a tribal tattoo is similar to the Indian custom of henna tattooing on brides. In this practice, names were hidden in the elaborate design stained onto the bride's skin. This can be emulated with a modern, tribal tattoo. Using finer lines and more intricate designs allows text to be hidden in the whorls of the design. 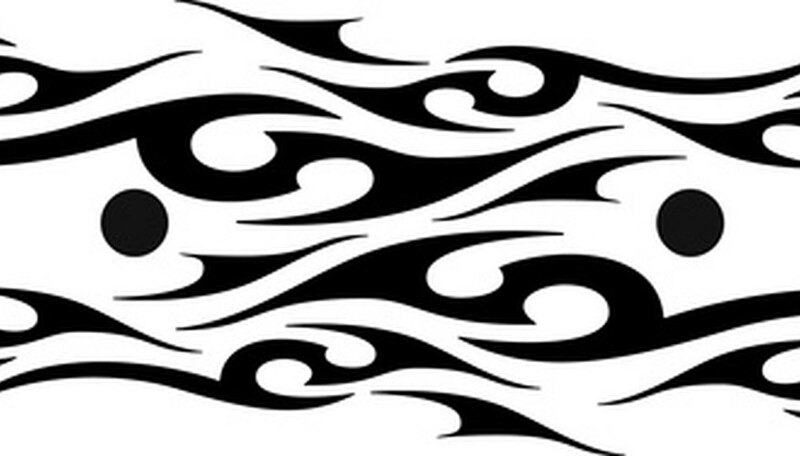 This type of design is suitable for many placements, and the intricate nature of the work means it is suitable for medium and larger tattoos. This method of creating a tribal name tattoo uses the lines of the design to create the letters of the name. In this manner the tribal design becomes a font. This method is suitable for large and small tattoos since it can be altered to be very intricate or simplified to include less detail. Intricate name designs work better for larger placements due to the area needed to display the detail and can be used on any area of the body where the design fits. Less intricate designs are suitable for both large and small pieces, since they will retain legibility even at smaller sizes. Combining a tribal design with text helps to create a personal tattoo design without the necessity of creating an entirely custom design. Certain pieces of tribal flash--pre-made designs--will have blank areas specifically for adding personal touches, such as a name. Choose one of these designs if you do not have time to create a custom design or do not need a unique tattoo. When selecting text to add to a tribal design, your options will be limited by the space within your design. Using less ornate fonts for smaller tattoos is recommended, where more ornate fonts work well in larger pieces. The text can be rendered in black or in colors to add interest to your tribal design.